When it comes to car repair, you can either take your vehicle into the dealership where it was purchased (or which sells the same make of car), or you can rely upon an independent auto body shop to repair your car. But which should you choose? There are vocal proponents of each type of vehicle repair shop, but the answer lies in a couple of deciding factors. Here’s how auto body shops and dealerships stack up against one another when you are in need of a repair. Dealerships must pay for training their technicians and provide special equipment and tools necessary for fixing a particular make of vehicle, in order to maintain their franchise licenses. This can translate to an advantage for the customer, since it practically guarantees excellent service by certified trained technicians. On the other hand, the cost of these specialized tools and training can make dealerships’ hourly rates higher than those of independent shops. Also, since a dealership’s primary money-maker is car sales, that means the service department is only their secondary priority, which can impact the level of personalized care you receive. Because they are not in the business of trying to sell you a new car, you can depend on independent body shops to take the time to explain the nature of your auto repair job in honest, simple terms. Customer service is their livelihood, and an independent body shop is going to try to go above and beyond to earn your repeat business. Also, independent body shops have realized the importance of keeping up with the latest technology and training, and are catching up to dealership technicians with ongoing training and recertification. Since dealership technicians are paid a flat rate, this means that if the customer is quoted four hours of labor for a repair, they are only charged for the four hours of labor even if the tech can’t complete it within that time frame. On the other side of things, if a technician is able to complete the labor in two hours’ time, he or she will still receive the flat rate for four hours’ labor that was quoted, even though he or she finished in half the time. This can cause technicians to hurry through a job, which can lead to mistakes. Independent shops tend to charge a flat rate for their services just as dealerships do; the only difference is that their technicians are paid an hourly rate based on actual performance, or a salary. This eliminates a technician’s incentive to finish a job in a rush, and they can take their time to make sure they have repaired the vehicle properly rather than racing to the next job. Because dealerships are likely to encounter the same make and models of vehicles every single day, they become expert at fixing that particular make of car. Additionally, dealerships have access to proprietary information, which means that they get one year’s worth of information about new vehicles they sell and service, which cannot be accessed by any other body shop. This information is vital for diagnosis and repair. Since an independent shop services vehicles of every make and model, they are not specialized in any one type of car; rather, the technicians at an independent auto body shop have years of experience from working on a broad range of vehicles, which makes them seasoned pros at diagnosing and repairing difficult issues that may go unnoticed by technicians at a dealership. At the end of the day, you will be satisfied with your vehicle repair experience as long as you go with a facility that you can trust, whose technicians are qualified to do the necessary repair work, and can provide affordable, excellent customer care and have you back on the road in as little time as possible. 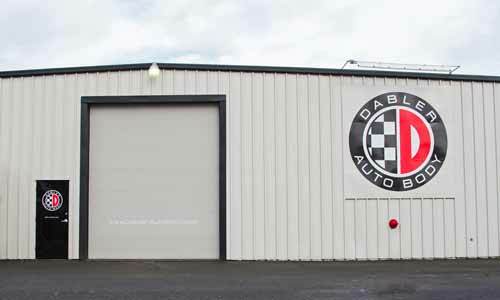 Looking for a reliable auto body shop in the Salem area? Contact Dabler Auto Body today! Our ASE certified technicians are committed to providing quality customer service on all makes and models, and are BMW and Mercedes-Benz Certified Repair Facilities. Call us at 503.585.8066 or schedule a collision repair. Thanks for the tips. My brother just had a fender bender in his VW. I was wondering were we should take it. It sounds like both dealerships and independent shops are good places to go. I do like that independent shops look for more things on the car to diagnose it. My car was destroyed last week in a car accident. Luckily it doesn’t have any fatal damage to any of the main parts of the car. The majority of the work to be done is body damage. I need to get some quotes to get it fixed. How many do you suggest that I get, I want to make sure to get the best deal I can? Maybe I can try getting one from the dealership too. It sounds like they have a lot of experience that could be helpful. I would tell you to get 3 quotes. I would also tell you to keep in mined that the initial estimate is just that. Once the car has been completely disassembled the shop may fined more hidden damage witch can lead to more money. I would tell you that good is not cheap and cheap is not good! My brother recently was hit by a drowsy driver while on a road trip with his family. You mentioned that since an independent show services vehicles of every make and model, they are not specialized in any one type of car. Do most auto body shops have the parts they need to fix any type of car or does it have to be ordered? Finding a reputable auto body shop might be a very good choice. All shops would have to order parts. The inventory cost would be extreme to hold parts for all makes and models. Yes take a look at reviews for body shops on Google and Carwise. I have always preferred finding a trustworthy local small auto body shop to work on my vehicles when needed. They are not all equal so you need to do some research and look at their work to be sure its quality but I feel there is more pride in the work.